Once again we hosted two weeks on this wonderful island, and as always, Crooked Island, and it's wonderful people, left our guests with memories that will last a lifetime. 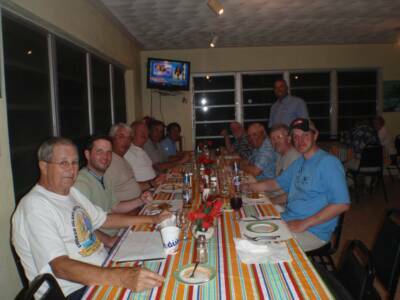 Below are some photos from the trip, as well as testimonials from some of the guests. We'll continue to add more as we receive them. "Vince, the late March trip to Crooked was nothing less than spectacular! Although the weather could have been a bit better for bonefishing, the excellence of the Landrail Point guides and their knowledge of the flats and creeks put us on fish everyday. 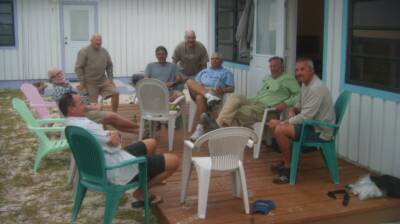 The accommodations at Casuarina Villas coupled with the food at Gibson's Lunchroom, hosted by Willy and Tony, was great. Our CCO host, Dan Pangaldi, made sure everything went according to plan, always showing the greatest concern for all members of our group. As we would say on Cape Cod, "he's a "keepah". Don't let this fellow out of your sight! I've fished with guides for bones on Andros and did a DIY trip to Long Island but Crooked was the best. 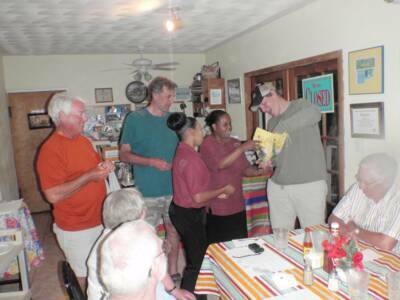 I could go on but will sum it up by requesting you get me the dates for the 2014 trip as soon as they're available. I'd be disappointed if I were shut out next year. Thanks again for pulling together a great trip." Orleans, MA/ Ft. Myers, FL. 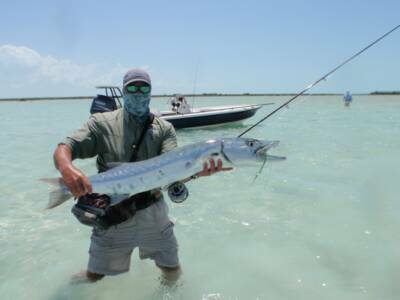 "Vince, 2 weeks is not enough when in a tropical fishing destination. 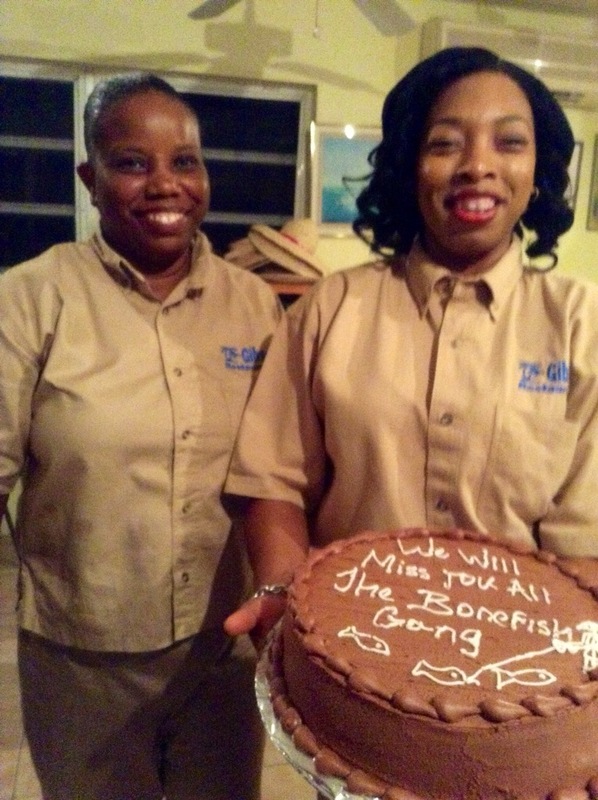 Crooked Island guides, and lunch staff are always there ready to help and the local people greet you with a big smile and wave. I have been there now a few times, and although the weather was colder than in previous years, the bone fish were on the larger size. 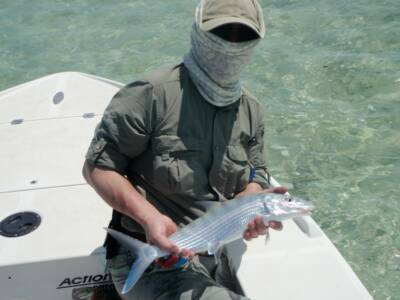 Shakey has taken time to explore other Permit fishing locations and has discovered at the end on Long Caye, a spot where we encountered 7 different groups and had opportunities to cast to them. Probably 20 Permit total, singles to up to 4 in one group. We had 2 drifts through the same section. 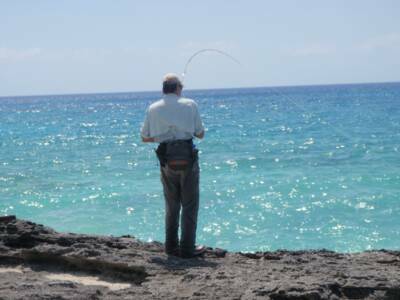 Fishing of the rocks by the Marina was excellent this year. 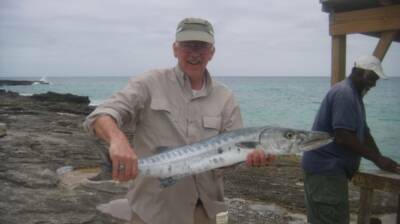 Numerous Horse Eye Jacks, some Blue Runners, a couple of very large Barracuda's, and even Mackerel. 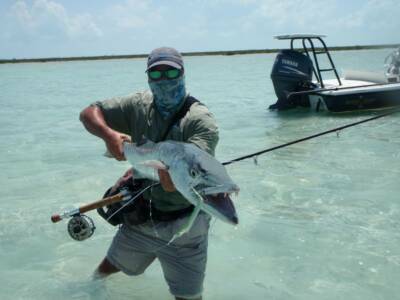 You had to be careful and alert when fishing there as the Lemon sharks where hungry and lost a few fish to them. Oh ya, baby Tarpon in the creek leading to the salt pond. 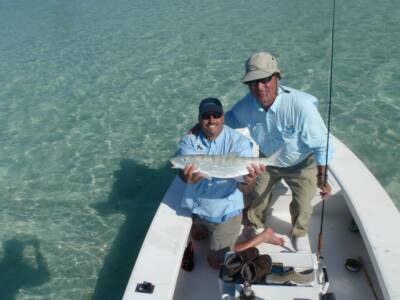 All in all, a great trip, and one of my picks for the best overall fishing experience." "Hi Vince, just got back last night. I know it's a great trip when I'm not ready to come home and both Hans and I agreed we could have stayed another week. Once again, all the guys were great to be with, both the people I'd met before and the new friends I met. Once again, Dan is such a great guy. He really looks after all the little details which goes such a long way in making the trip flawless. I look forward to seeing him again next year. All the guides, Willie and her staff and just any body you meet on the street are so friendly and accommodating that it's like they have been your friends for life. I enjoyed it so much that I would like you to pencil me in for another 2 weeks next year. If it happens that you will be running the Acklins trip either a week before or a week after Crooked Island, I would take a week there too. I'm a glutton for punishment!" "Hi Vince, thank you for arranging such a wonderful trip. Everything was outstanding. Although I am a fisherman, I am not an experienced bone fisherman. With Dan's guidance, I was able to identify and work on my skills to help me improve. Dan is a true professional . He went out of his way to ensure that everyone was comfortable and enjoying their stay. I look forward to next year's trip. Thank you! " "Hi Vince, I had a great time. Everybody in the group was great. I bunked & fished with Bill Reiher. He was a lot of fun. Dan was a gracious host & did a good job keeping up wit everything. 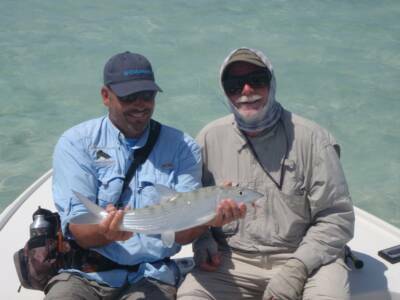 I caught a good number of bonefish & a good size barracuda. 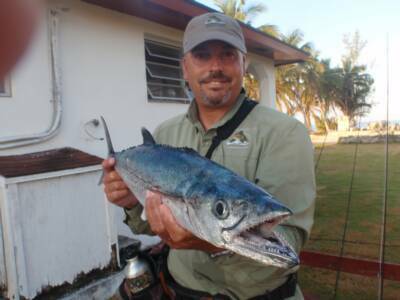 I was fishing off the rocks by the marina & caught a fair size jack (nothing too big)." "Hi Vince, I wanted to thank you for organizing a truly memorable trip to Crooked Island. This was my second use of your services. Both the Ivels DIY trip and the hosted Crooked Is. trip far exceded my expectations. 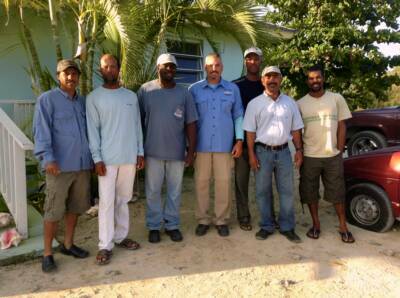 The guides at C.I. did a great job under difficult weather conditions, one of the more enjoyable days was the day we couldn't Bonefish but instead fished for Mutton Snappers. Its great that there are alternatives. Dan did a fantastic job of coordinating the trip and offering his insights. It was great to have him along on two of the days, 2 guides for the price of one.He and guide Kenny are a lot of laughs when they're together. The food at Willies was A1, with even seconds offered, and probably the best I've experienced in many trips to the Bahamas over the years. The accomodations at the Villas were fine. You can't beat oceanfront. 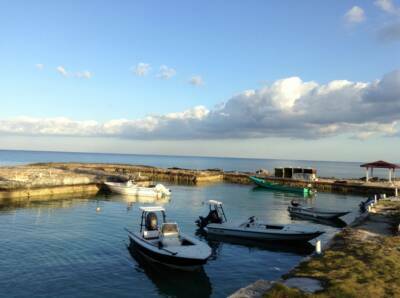 I would surely love to do the trip again."